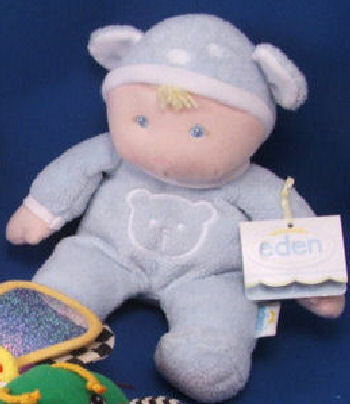 I’m looking for an Eden blond NUZZY baby boy doll with knit face and hands. He’s wearing a blue terry velour sleeper embroidered with a bear on the tummy, and there are bear ears on his cap. It has a rattle in it. My son recently lost his “baby” that he’s had since he was born. It was his favorite. We thought it was in his suitcase after a recent sleepover, but when he got home it wasn’t there, and my sister in law turned her house upside down looking for it, but it isn’t there either. Although he no longer slept with it every night, he asks for it almost daily. He just likes to know it’s around. Buy it now 24.99 with 12.07 shipping because it is coming from Canada. Thanks, Susan. She found one on a site and ordered it, but hasn’t heard yet if it’s been shipped. But I sent the link to her anyway. ebay #330363473342 new with tags buy now or make offer.